Several months ago, I interviewed Dale McGowan, an atheist dad and the author of two books, Parenting Beyond Belief: On Raising Ethical, Caring Kids Without Religion, and its followup, Raising Freethinkers: A Practical Guide to Parenting Beyond Belief. Among other things, McGowan is an advocate for exposing children to a variety of religions first-hand so that they might feel free to draw their own conclusions. He told me that, over the years, he has schlepped his own three kids to a host of temples, mosques, churches and synagogues — all to help them understand what religion is and how it works. McGowan goes to these services as an observer, not a believer, but he finds the visits fascinating and worthwhile — and, he says, so do his kids. Naturally, I thought it serendipitous when, around the time of the McGowan interview, I received an invitation to attend the Catholic baptism of a good friend's son. Such a great excuse, I thought, to show my own daughter the inside of a church. When I explained to Maxine what we’d be doing, she was thrilled — especially when I told her baby Alec would be sprinkled with water during this particular ceremony. 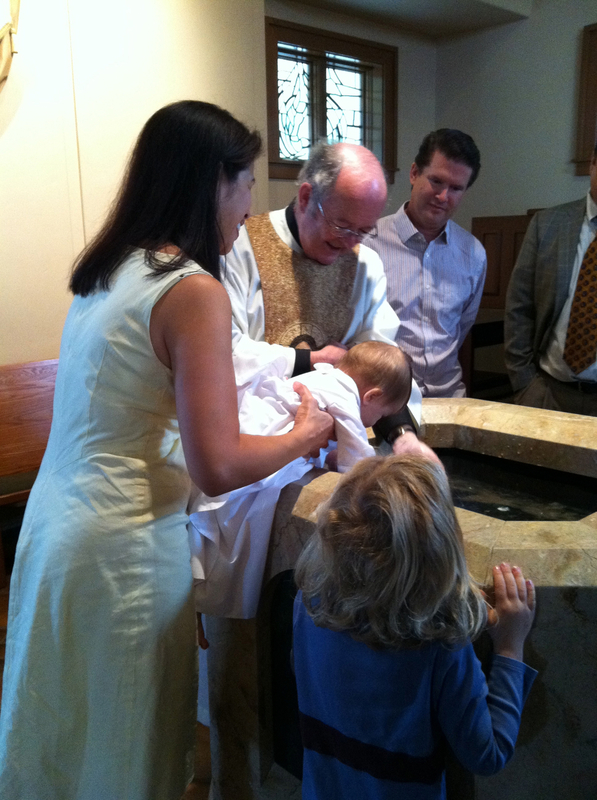 In the weeks leading up to the big day, we chatted a bit about what it meant to be baptized. Maxine wanted to know, for instance, why she had not been baptized. I told her that baptisms were a way to symbolize a child’s membership into her parents’ church, and that her parents didn’t belong to any church. That seemed to satisfy. On the day of the baptism, my sister and I, along with her son and my daughter, loaded into one car and headed to the church about an hour away. Halfway there, Maxine started to get antsy. “Are we there yet?” she asked a bunch of times, despite the fact that I kept telling her she was being so cliche. Finally, the car came to a stop for the first time since we’d left home. Maxine was ecstatic. She rose up in her car seat, her face bright and smiling. She took in everything around her. “Is this where Alec is going to be baptized?” she asked, hopefully. By the time we got to the church, she was back to being fully charged. While other children squirmed in the pews, looking everywhere but forward, Maxine literally (and by literally, I mean literally) sat on the edge of her seat, riveted by the priest’s every word. She seemed to watch with the same level of obsessive interest she only ever afforded "Phineas and Ferb." When it was our time to rise and see Alec receive the sacrament, Maxine squeezed in for a front-row view. As you can see, she was easily close enough to the water to be baptized by proximity. It was hard not to wonder if I had given birth to a natural-born Christian. After all the children had been blessed, the priest lit some candles and read from the Bible. Then me made his closing remarks, and people began to collect their things. That’s when Maxine turned to me. “But when are they going to start throwing water at each other?” she asked, clearly confused. “They don’t throw water at each other,” I said. Then, as the dark shadow of disappointment moved in, I watched my little girl's face fall for the second time that day. No wonder she'd been so riveted by church, I thought. She'd expected a water fight.